The U.S. state of Colorado is divided into 64 counties. Counties are important units of government in Colorado since there are no townships or other minor civil divisions. Two of these counties, Broomfield and Denver, have consolidated city and county governments. Colorado's ISO 3166-2:US state code is CO and its ANSI INCITS 38:2009 state code is 08. When the Colorado Territory first began creating counties in 1861, 17 counties (Summit, Larimer, Weld, Boulder, Gilpin, Clear Creek, Jefferson, Arapahoe, Douglas, Lake, Conejos, Costilla, Park, Fremont, El Paso, Pueblo, and Huerfano) and a Cheyenne Reserve were formed. In February 1866, the first new county, Las Animas, was created, followed by Saguache in December of that year. Bent County was created in February 1870, followed by Greenwood the following month. On February 2, 1874, Grand County and Elbert County were formed, and on February 10, La Plata, Hinsdale, and Rio Grande counties were created. Greenwood was absorbed into Bent on February 5. The last county to be created under the Colorado Territory name was San Juan County, created three months before statehood. By the time Colorado became a state on August 1, 1876, it had only 26 counties. In January 1877, Routt and Ouray were formed, followed by Gunnison and Custer counties in March. In February 1879, Chaffee County was created. From February 8–10, 1879, Lake county was renamed Carbonate County. In 1881, Dolores County and Pitkin County were created. In 1883, Montrose, Mesa, Garfield, Eagle, Delta, and San Miguel counties were formed, leaving the total number of counties at 39. The number rose to 40 in 1885 with the creation of Archuleta County on April 14. Washington County and Logan County were both created in 1887. Between February 19 and April 16 in 1889, Morgan, Yuma, Cheyenne, Otero, Rio Blanco, Phillips, Sedgwick, Kiowa, Kit Carson, Lincoln, Prowers, Baca, and Montezuma counties were formed, bringing the total to 55. By 1900, Mineral County and Teller County had been added. On November 15, 1902, Arapahoe County was split into Adams and South Arapahoe Counties, and Denver was consolidated as a city-county from portions of both newly-formed countie on December 1, 1902. By 1912, Jackson County, Moffat County, and Crowley County had been created. Alamosa was created in 1913, and in 2001, Broomfield was recognized as a city-county, bringing the total to 64 counties. The International Committee for Information Technology Standards (INCITS) county code. A link to a detailed transportation map of the county. The reference longitude of the county. Taos County Territory of New Mexico 185201091852-01-09 186102281861-02-28 Originally one of the seven partidos of the Spanish, and later Mexican, province of Santa Fe de Nuevo México. One of the nine original counties created by the Territory of New Mexico in 1852. Excluded from the new Territory of Colorado in 1861. Great Salt Lake County Territory of Utah 185203031852-03-03 186102281861-02-28 Created in 1852, and excluded from the new Territory of Colorado in 1861. Green River County Territory of Utah 185203031852-03-03 186102281861-02-28 Created in 1852, but never organized. Dissolved in 1857, but recreated in 1859. Excluded from the new Territory of Colorado in 1861, and the Territory of Wyoming in 1868. Finally dissolved in 1872. Iron County Territory of Utah 185203031852-03-03 186102281861-02-28 Created in 1852, and excluded from the new Territory of Colorado in 1861. Sanpete County Territory of Utah 185203031852-03-03 186102281861-02-28 Created in 1852, and excluded from the new Territory of Colorado in 1861. Utah County Territory of Utah 185203031852-03-03 186102281861-02-28 Created in 1852, and excluded from the new Territory of Colorado in 1861. Washington County Territory of Utah 185203031852-03-03 186102281861-02-28 Created in 1852, and excluded from the new Territory of Colorado in 1861. Arapahoe County Territory of Kansas 185508251855-08-25 186101291861-01-29 Created in 1855, but never organized. Reverted to unorganized territory when Kansas joined the Union in 1861. Beaver County Territory of Utah 185601051856-01-05 186102281861-02-28 Split from Iron and Millard counties in 1856. Excluded from the new Territory of Colorado in 1861. Broderick County Territory of Kansas 185902071859-02-07 186101291861-01-29 Split from Arapahoe County in 1859, but never organized. Reverted to unorganized territory when Kansas joined the Union in 1861. El Paso County Territory of Kansas 185902071859-02-07 186101291861-01-29 Split from Arapahoe County in 1859, but never organized. Reverted to unorganized territory when Kansas joined the Union in 1861. Fremont County Territory of Kansas 185902071859-02-07 186101291861-01-29 Split from Arapahoe County in 1859, but never organized. Reverted to unorganized territory when Kansas joined the Union in 1861. Montana County Territory of Kansas 185902071859-02-07 186101291861-01-29 Split from Arapahoe County in 1859, but never organized. Reverted to unorganized territory when Kansas joined the Union in 1861. Oro County Territory of Kansas 185902071859-02-07 186101291861-01-29 Split from Arapahoe County in 1859, but never organized. Reverted to unorganized territory when Kansas joined the Union in 1861. Peketon County Territory of Kansas 185902071859-02-07 186101291861-01-29 Created in 1859, but never organized. Reverted to unorganized territory when Kansas joined the Union in 1861. Arrappahoe County Territory of Jefferson 185911281859-11-28 186102281861-02-28 One of the 12 counties created by the extralegal Territory of Jefferson in 1859. Cheyenne County Territory of Jefferson 185911281859-11-28 186102281861-02-28 One of the 12 counties created by the extralegal Territory of Jefferson in 1859. El Paso County Territory of Jefferson 185911281859-11-28 186102281861-02-28 One of the 12 counties created by the extralegal Territory of Jefferson in 1859. Fountain County Territory of Jefferson 185911281859-11-28 186102281861-02-28 One of the 12 counties created by the extralegal Territory of Jefferson in 1859. Heele County Territory of Jefferson 185911281859-11-28 186102281861-02-28 One of the 12 counties created by the extralegal Territory of Jefferson in 1859. Jackson County Territory of Jefferson 185911281859-11-28 186102281861-02-28 One of the 12 counties created by the extralegal Territory of Jefferson in 1859. Jefferson County Territory of Jefferson 185911281859-11-28 186102281861-02-28 One of the 12 counties created by the extralegal Territory of Jefferson in 1859. Mountain County Territory of Jefferson 185911281859-11-28 186102281861-02-28 One of the 12 counties created by the extralegal Territory of Jefferson in 1859. North County Territory of Jefferson 185911281859-11-28 186102281861-02-28 One of the 12 counties created by the extralegal Territory of Jefferson in 1859. Park County Territory of Jefferson 185911281859-11-28 186102281861-02-28 One of the 12 counties created by the extralegal Territory of Jefferson in 1859. Saint Vrain CountySt. Vrain County Territory of Jefferson 185911281859-11-28 186102281861-02-28 One of the 12 counties created by the extralegal Territory of Jefferson in 1859. Saratoga County Territory of Jefferson 185911281859-11-28 186102281861-02-28 One of the 12 counties created by the extralegal Territory of Jefferson in 1859. Mora County Territory of New Mexico 186002011860-02-01 186102281861-02-28 Split from Taos County and San Miguel County in 1860. Excluded from the new Territory of Colorado in 1861. Guadalupe County Territory of Colorado 186111011861-11-01 186111071861-11-07 One of the 17 original counties created by the Territory of Colorado in 1861. The county was renamed Conejos County after only six days. Greenwood County Territory of Colorado 187002111870-02-11 187402061874-02-06 Created from former Cheyenne and Arapaho tribal land and the eastern portion of Huerfano County in 1870. The county was abolished in 1874 and its territory split between Elbert County and Bent County. Platte County Territory of Colorado 187202091872-02-09 187402091874-02-09 Created from the eastern portion of Weld County in 1872. The county was abolished in 1874 after organizers failed to secure voter approval. The territory of the county was returned to Weld County. Carbonate County State of Colorado 187902081879-02-08 187902101879-02-10 Lake County was renamed Carbonate County in 1879. Only two days later, Carbonate County was split into the new Chaffee County and a recreated Lake County. Uncompahgre County State of Colorado 188302271883-02-27 188303021883-03-02 Ouray County was renamed Uncompahgre County for only four days in 1883. South Arapahoe County State of Colorado 190211151902-11-15 190304111903-04-11 One of three counties created from Arapahoe County in 1902. The name was changed back to Arapahoe County after five months. No organized counties of the District of Louisiana, the Territory of Missouri, the extralegal State of Deseret, or the Territory of Nebraska existed within the present boundaries of the state of Colorado. 1. Costilla County was the first area within the present State of Colorado to be settled by Europeans in 1851. 2. Taos County, created by the Territory of New Mexico in 1852, was the first organized county to extend into the area of the present State of Colorado. 3. Arapahoe County, created by the Territory of Kansas in 1855, was the first county created exclusively within the area of the present State of Colorado. 6. Of the 17 original Colorado counties created in 1861, only Gilpin County and Clear Creek County have retained their original boundaries with only minor survey changes. 7. Guadalupe County was the first Colorado county to be renamed in 1861. 8. Las Animas County was the first new Colorado county to be created (in 1866) after the original 17 counties. 9. Greenwood County was the longest lived former Colorado county, existing four years from 1870 to 1874. 10. In 1876, San Juan County became the last county created by the Territory of Colorado. 11. In 1877, Ouray County became the first county created by the new State of Colorado. 12. Carbonate County was the shortest lived former Colorado county, existing only two days in 1879 before being dissolved. 13. The City and County of Broomfield became the newest Colorado county in 2001. 14. Las Animas County is the most extensive Colorado county. 15. The City and County of Broomfield is the least extensive Colorado county. 16. El Paso County is the most populous Colorado county. 17. San Juan County is the least populous Colorado county. 18. El Paso County and the City and County of Denver are among the 100 most populous counties of the United States. 19. San Juan County, Mineral County, Hinsdale County, Jackson County, Kiowa County, Cheyenne County, and Dolores County are among the 100 least populous counties of the United States. 20. The City and County of Denver is the most densely populated Colorado county. 21. Hinsdale County is the least densely populated Colorado county. 22. Hinsdale County, Kiowa County, Mineral County, and Jackson County have fewer than one resident per square mile (0.386 km−2). 23. Lake County has the highest point in Colorado at the summit of Mount Elbert at 14,440 feet (4,401 m) elevation (the highest point in the entire Rocky Mountains). 24. Summit County, Pitkin County, and Eagle County each had a 2014 life expectancy of more than 85 years, the three longest-life counties in the United States. 25. Yuma County has the lowest point in Colorado where the Arikaree River flows into Kansas at 3,317 feet (1,011 m) elevation (the highest low point of any U.S. state). 26. Jefferson County borders ten other counties, the most of any Colorado county. 27. Delta County and the City and County of Denver each border only three other counties, the fewest of Colorado counties. 30. Weld County has the most incorporated municipalities of any Colorado county with 31. 32. Of all 64 Colorado counties, only Conejos County has a county seat that is not an incorporated municipality. 34. The City and County of Denver and the City and County of Broomfield are the only two Colorado counties with enclaves. 35. Arapahoe County, Boulder County, and Jefferson County are the only three dismembered Colorado counties with exclaves. ^ City Council of the City and County of Denver v. Board of Commissioners of Adams County , 77 P. 858, 861 (1904). ^ The ANSI INCITS 31:2009 county code is the five-digit code which uniquely identifies counties and county equivalents in the United States. The three-digit number is unique to each individual county within a state, but to be unique within the entire United States, it must be prefixed by the two-digit ANSI INCITS 31:2009 state code. This means that, for example, while Adams County, Colorado is 001, Belknap County, New Hampshire and Alachua County, Florida are also 001. 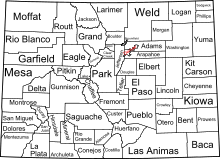 To uniquely identify Adams County, Colorado, one must use the state code of 08 plus the county code of 001; therefore, the unique nationwide identifier for Adams County, Colorado is 08001. The links in the column INCITS are to the Census Bureau Info page for that county. ^ a b National Association of Counties. "NACo - Find a county". Archived from the original on September 27, 2007. Retrieved 2008-04-30. ^ "Colorado County Seats". State of Colorado, Department of Public Health and Environment. 2007-01-30. Retrieved 2007-01-30. ^ a b c "Colorado Government History". State of Colorado, Department of Personnel & Administration, Colorado State Archives. 2001-04-18. Retrieved 2008-09-25. ^ "2010 United States Census website". United States Census Bureau, Population Division. Archived from the original on October 6, 2013. Retrieved April 22, 2011. ^ a b The name "Saguache" is pronounced /səˈwætʃ/. This name comes from the Ute language noun "sawup" /səˈwʌp/ meaning "sand dunes". The Spanish language version of this name is usually spelled "Saguache", while the English language version is usually spelled "Sawatch". ^ a b c d e f g h i j k "Annual Estimates of the Resident Population for Counties: April 1, 2010 to July 1, 2013". 2013 Population Estimates. United States Census Bureau, Population Division. March 2014. Retrieved April 18, 2014. ^ a b "Colorado Government History". State of Colorado, Department of Personnel & Administration, Colorado State Archives. April 18, 2001. Retrieved May 2, 2011. ^ "Colorado County Seats". State of Colorado, Department of Public Health and Environment. Retrieved May 2, 2011. ^ "Colorado Department of Transportation Maps". State of Colorado, Department of Transportation. Retrieved May 6, 2011. ^ a b Elevations include an adjustment from the National Geodetic Vertical Datum of 1929 (NGVD 29) to the North American Vertical Datum of 1988 (NAVD 88). For further information, please see this United States National Geodetic Survey note. ^ Only a few of these county low points have been verified. ^ a b Provisional Laws and Joint Resolutions of the General Assembly of Jefferson Territory. General Assembly of the Territory of Jefferson. 1859–1860. Retrieved 2011-05-05. ^ Jefferson County, Colorado, borders Boulder County, the City and County of Broomfield, Adams County, the City and County of Denver, Arapahoe County, Douglas County, Teller County, Park County, Clear Creek County, and Gilpin County, Colorado. ^ Delta County, Colorado, borders Gunnison County, Montrose County, and Mesa County, Colorado. The City and County of Denver, Colorado, borders Adams County, Arapahoe County, and Jefferson County, Colorado. ^ "Mean County Elevation Lists". County Highpointers. Retrieved May 2, 2011.